The game of 7 Card Stud poker has only recently lost popularity to Texas Hold’em, although there are many, many die-hard 7 Card stud players out there. The basic 7 Card Stud strategy that most players use is to apply the principles of careful observation and card memorization, as well as the tendencies of your opponents (if you are playing with familiar players). On most 7 Card Stud tables, players must make an initial, pre-determined ante before any cards have been dealt. After everyone has placed their ante, players are dealt two face-down and one face up card- this is called 3rd Street. Your door card is the face up card and the person with the lowest door card posts the “bring in”. Bring in is determined by the value of the suit. From lowest to highest bring in suit values are clubs, diamonds, hearts, and spades. Each round of betting is referred to as a street, 3rd street through 7th street. The next betting rounds are almost identical and for each round, players get another face up card. The highest hand showing determines where betting begins. Limits go up on 5th street. The 7th street card is dealt face down, with a total of four face-up cards and three face down cards now on the table. 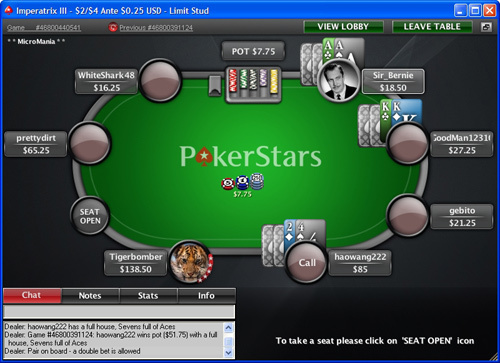 The face up cards are referred to as the each player’s porch. After betting on the 7th street, or final card, the showdown occurs and the player with the best five cards is declared the winner. Standard poker hand rank is considered in declaring the winner. The most important decision in 7 Card Stud strategies is the starting hand selection. The most playable hand is three of a kind or a pair of tens or better. Three of a flush should be played with caution, as is three of a straight. A straight that is an outside straight, such as ten-jack-queen is more playable than a belly buster straight like queen-king-ace because you have eight possibilities of drawing the card you need, as opposed to four (and of course, being observant of other face up cards on the table can reduce the possibilities even further). Pairs of nines or smaller should are not a good bet, unless they are accompanied by a kicker card like an ace. If you make it to 4th street with good cards, always play cautiously as to not alert the other players of your good hand. This is especially true if you have went only this far and have three of a kind or even four of a kind, or two pair. This lets the players who might have fairly good hands gain confidence and thus makes the pot grow all the larger. Never stay in past 4th street with a pair lower than tens unless you are getting in free or for low dollar antes. Follow the idea of slow play throughout the rest of the game all the way to the showdown to increase pot size. To maximize your profits, now is not the time to act cocky or give away your hand – if a player gets scared and folds, then you take home less value. This article was submitted by my friend Josh. Edits for clarity and readability have been made.